The First Epistle tae the Thessalonians, uisually referred tae semply as First Thessalonians (written 1 Thessalonians an abbreviatit 1 Thess. or 1 Thes. ), is the thirteent beuk frae the New Testament o the Christian Bible. 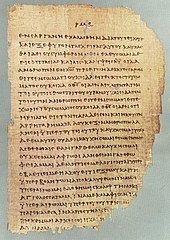 The first letter tae the Thessalonians wis likely the first o Paul's letters, probably written bi the end o AD 52. ↑ Chicago Manual of Style, 16th Ed. ↑ Raymond E. Brown, An Introduction to the New Testament, Anchor Bible, 1997. pp. 456–466. This page wis last eeditit on 12 October 2018, at 20:10.